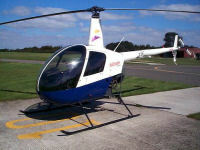 Trial flying lesson in a Robinson R22 helicopter with 20-minute pre-flight briefing and 30 minutes in the air. After the instructor has explained how the helicopter flies and what the controls do, under the careful guidance of the instructor, take to the air and experience the thrill of helicopter flight! Try going up and down, round in circles, hovering and looking at the local countryside. We provide a certificate of achievement after the flight. There is a weight restriction of 17 stone.